Santa Clara Vanguard finished another successful rehearsal camp during the first weekend of March. 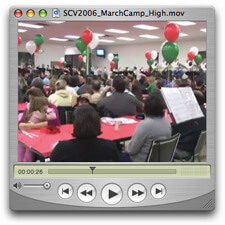 A video clip posted on their Web site features the brass section playing at the Vanguard "birthday dinner" event in addition to a sneak peak at the first two movements of the group's 2006 program, "Moto Perpetuo." Check it out on www.scvanguard.org.